Victoria + Albert is pleased to unveil a stunning new line of stainless steel faucets known as Soriano. This contemporary collection of Italian-made fixtures is the result of another successful collaboration with design powerhouse Meneghello Paolelli Associati. Their singular inspiration for Soriano came from the Boolean world of coding logic, which is reflected in the “1s” and “0s” that are the essence of each faucet. 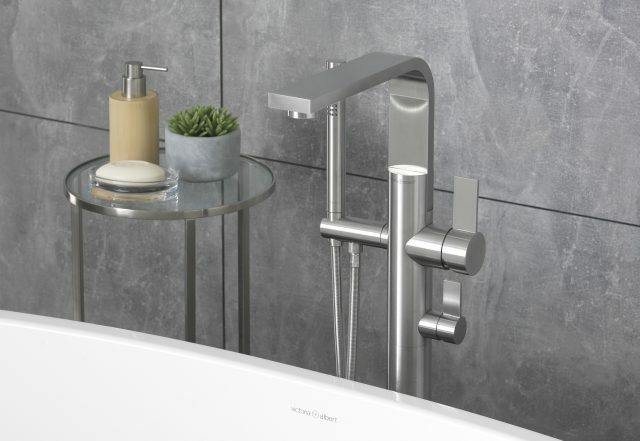 The finished look is brilliant in its simplicity, with the spout, lever and base of each piece defined by one shape, creating a sleek silhouette that is a decidedly modern addition to any luxurious bathroom. The Soriano Collection is notable for its exceptional craftmanship as well as its good looks. Made from stainless steel construction throughout, the faucets are beautifully finished in a brushed stainless steel as well. This new finish option from Victoria + Albert delivers impressive durability and is easy to maintain. “We aimed to create a clean, sharp and elegant collection. We see these values as inner elements of the Stainless steel itself. We tried to work with this material by giving expression and supporting these characteristics, without forcing its nature. Geometry, intersection and Boolean are the key words of Soriano,” says Meneghello Paolelli Associati. Victoria + Albert makes it easy to create a cohesive bathroom space by offering four different Soriano configurations, all designed to perfectly complement its own line of sinks, tubs and vanities. The Soriano 9 is a three-hole basin mixer with adjustable aerator that brings a gleaming sophistication to the sink area. The Soriano 14 is a natural fit for freestanding tubs with its floor-mounted design and handheld shower attachment. Featuring a “monoblock” design, the Soriano 16 is a deck-mounted basin mixer with a single handle, closely echoing the Soriano 19 with its lower level design profile. Both bring a stylish flair to the bathroom with their bold lines and graceful curves. The Soriano collection also comprises a concealed shower collection, a new configuration for Victoria + Albert for 2018. The concealed collection allows the consumer to mix and match with different components to find the perfect combination for their bathroom. Start with the Hub 01 concealed valve, which is thermostatically controlled for safety. This two-way hub is compatible with the diverter control (Soriano 31), which allows the installer to choose between two water outlets from a bath spout (Soriano 43), handheld shower (Soriano 42) and shower rose (Soriano 41). Concealed shower applications are notable for their clean, minimal aesthetic, a look commonly seen in luxurious hotels. The Soriano Collection is the latest example of Victoria + Albert’s engineering excellence – a lustrous line of inspired faucets that are elegant works of art. Learn more about these exceptional fixtures at https://www.youtube.com/watch?v=dMQGsx1Vcp0.